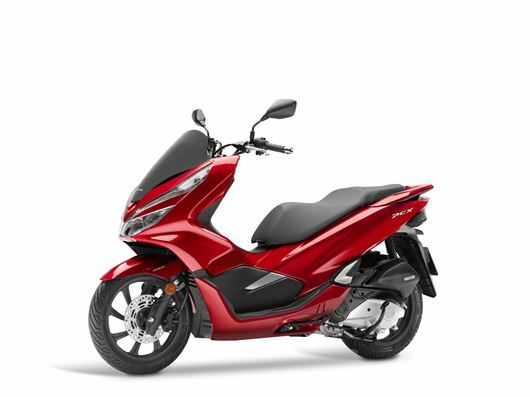 Honda has completely revamped its best-selling PCX 125 scooter for 2018. It now features a brand new tubular cradle frame, wheels and rear suspension, and gains ABS brakes as standard. The new chassis saves 2.4kg from the weight of the PCX compared to its predecessor and the new eight-spoke wheels are now mounted on hollow hubs to further trim excess flab. Overall kerb weight is now 130kg. Honda claims the new wheels and hubs help improve low-speed handling and there’s now a 2mm shorter wheelbase to further assist with manoeuvring in town. New tri-rate rear shock absorbers have been mounted further to the rear of the scooter to give a smoother ride. The 125cc four-stroke single-cylinder petrol engine gains more power, rising to 12.2PS, while low-down torque remains unaffected at 11.8Nm. Honda has achieved this with a larger air box and bigger throttle bodies. The PCX retains the Selectable Idling Stop function that made its debut on this scooter in 2016. As well as the changes to the mechanics, Honda has revised the styling and uses a plastic main fairing stay for the first time in place of the previous steel structure. The front retains the swooping lines of the screen but there are now thinner LED headlights and indicators, while LED illumination is also used for the tail unit. Four colour choices are on offer in white, black, grey or red. The seat height has been raised by 4mm but remains manageable for most riders at 76mm. This provides more legroom thanks to an extended front foot board. Other new additions for greater practicality include one-touch opening for the seat and fuel filler, and a larger left-hand fairing pocket with an easier to open lid. This pouch also holds a 12-volt power socket. Under the seat unit, there’s improved luggage capacity, going up to 28-litres from the previous PCX’s 27-litres. It can swallow a full-face helmet and the tool kit has been relocated to underneath the seat. A new dash comes with an LCD display for speed and trip information. Honda has also given the PCX a classier look with chrome around the main instruments and tapered bar ends. Honda has yet to confirm prices for the new PCX 125, but it’s expected they will be very close to the £2899 of the outgoing model that has sold 140,000 units since its introduction in 2010.